The 19th century witnessed a considerable change in the diet of the middle and working classes. Tinned foods and powered provisions were available from grocers; bread was cheaper than ever before - as was meat, and dairy produce. Products such as tea, coffee and fruit were now widely imported. Crystal Rizine was a food supplement designed to replace rice, cornflour and "other farinaceous preparations" (ie, made with flour or meal). 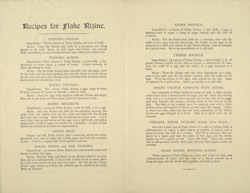 These supplements were popular because they were cheap, and, according to this leaflet, made, "highly nutritious, pure and most digestible food".